Awesome and seldom seen Wings Cigarette promotional radio by Brown and Williamson Cigarette Mfg. 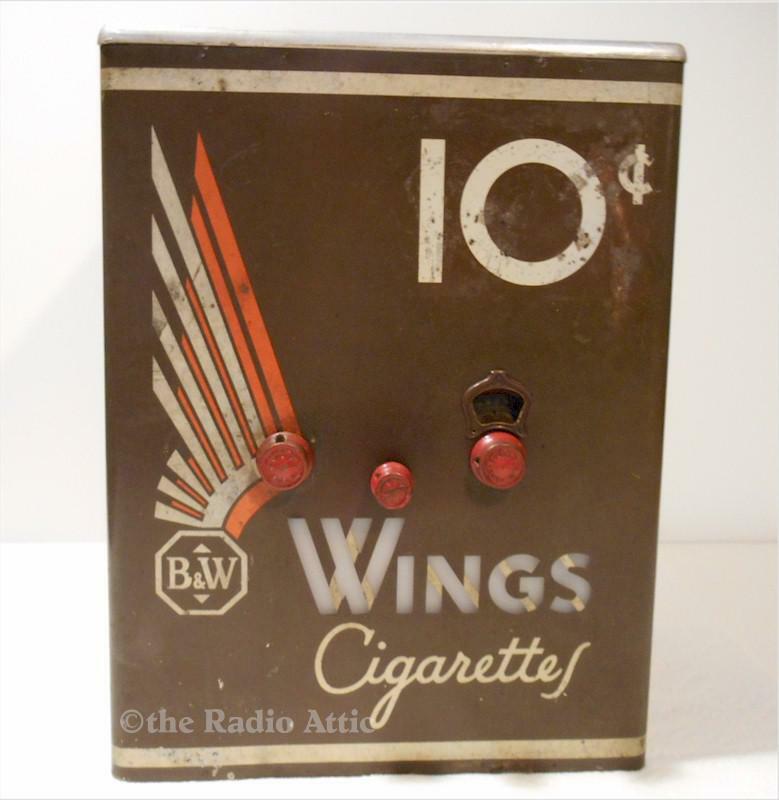 of Louisville, KY. Countertop radio depicting a pack of cigarettes with a tin litho cabinet titled "10 cents Wings cigarettes B&W" with artwork of wings. By RCA Victor. Original label is marked model R-26-BWC, appears to be complete and original with matching knob, original top with cut out and wire cloth grille, with backlit "WINGS." It has finish wear and scuffs as you can see; scratching in case, otherwise excellent. Plays well. Wings Cigarettes were introduced in 1929 by Brown & Williamson Tobacco Company of Louisville, KY. With the coming of the Great Depression, Wings were sold for ten cents while most major brands were fifteen and their sales skyrocketed. During WWII, the company also sponsored a radio show called "Wings of Destiny" which was highly popular. Please look at all the pics as they are part of description. 16-1/4"H x 12"W x 8"D.
You are visitor number 1,665 to this page.